Just cooking. And eating. Cooking and eating. I subscribe to the blog Steamy Kitchen (and follow her on Twitter and Facebook). I love her photography and her recipes are really good, too! 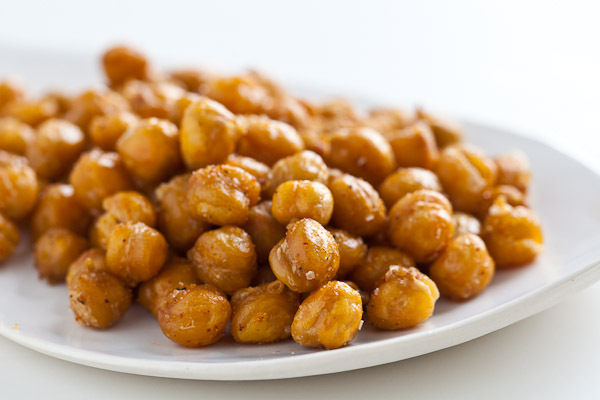 Last week I got an email update for the recipe for Crispy Roasted Chickpeas. Since I’m always looking for a new, healthy snack alternative, off to the store I went to get a can of good ol’ chickpeas. Audrey helped me peel the skins off of the beans and into the oven they went! I thought they were really good – and Audrey did, too! Kind of a cross between a peanut and Corn Nuts. Here’s the recipe in case you’d like to try to make them, too! This entry was posted in Steamy Kitchen and tagged cheap, easy, snack. Bookmark the permalink.